In a garden, there are few things as important as soil and air temperature. It can be sunny but only 10 degrees outside, which is hardly the type of weather to grow plants in. The rise and fall of the mercury in a thermometer marks the change of seasons also. If you are concerned about the weather you may want to get a thermometer with a barometer. Certain plants should only be planted once the temperature reaches a certain point, and what better way to know for sure how warm it is, than with your own garden thermometer. In this way, you know the true temperature of your geographic location. 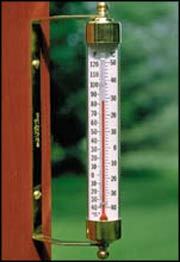 Outdoor thermometers are available in many different styles, and are made out of many different materials. You want to buy one that will be weather resistant. Most thermometers will be wall mounted in a convenient location for ease of reading. There are also garden thermometers that stick into the ground to provide an actual soil temperature. What better way to know when to plant those seeds! If you have a certain décor you want to maintain, thermometers can be found to match just about anything. There thermometers with designs of frogs, butterflies, turtles, garden tools, hats, bees, and many other designs. There are also thermometers available with very techno appearance and others that are very architectural and artistic.